The G20, the EU and other SME institutions bemoan the fact that SMEs have difficulties in accessing finance and thus retarding growth. The surprising fact is that in the US only 4% of owners of businesses had problems in financing their operations. 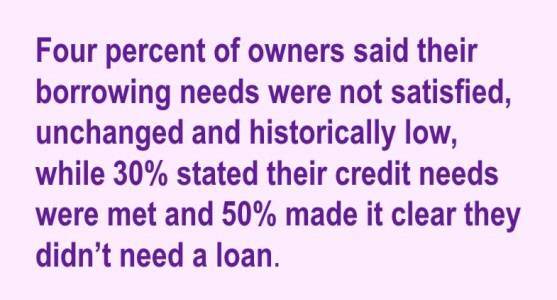 The majority stated that they did not need access to finance! The National Federation of Independent Businesses’ (NFIB) Small Business Optimism Index reached its highest level this year, but it still remains below December’s level. The survey increased 1.4 points to 98.3 with six of the 10 index components increasing. “Overall, the index remained in a holding pattern, a few points below the prerecession average, although at the 42-year average, and showing no tendency to ‘break out’ into a stronger pattern of economic growth,” NFIB noted in its report. Over the month, the earnings component added nine points, reaching a new cycle high. Sales also rebounded into positive territory for the first time since 2012. Regardless, sales expectations were moderate, NFIB said.